Proceeds from Friday's release of Homefront IPA will benefit Operation Homefront. 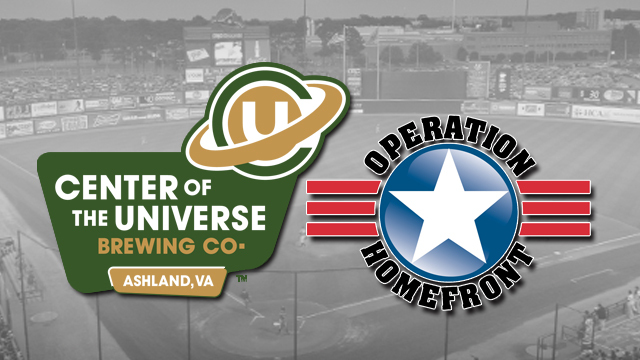 RICHMOND, VA - The Richmond Flying Squirrels, Double-A affiliate of the San Francisco Giants are excited to announce that once again Homefront IPA, a specialty beer brewed by Center of the Universe Brewery with all proceeds going directly to Operation Homefront, will be released at The Diamond and available for a limited time on Friday night. Center of the Universe Brewery along with 10 other designated breweries across the country brew this IPA for the Memorial Day weekend to benefit Operation Homefront, a non-profit with a nationwide organization that provides emergency and other financial assistance to the families of service members and wounded warriors. Operation Homefront has provided assistance to thousands of military families since its inception in 2002. The 11 breweries combined donate 100% of proceeds and will raise a minimum of $150,000 for Operation Homefront this year. "Homefront IPA is our way of saying 'thank you' to all of the men and women who dedicate themselves to protecting our safety and our way of life," said Chris Ray, Co-founder of Center of the Universe and former Major League pitcher. "By releasing this beer so close to Memorial Day at The Diamond, we hope to give a reminder to everyone of how important the past, present, and future members of our armed forces are and to remember the ultimate sacrifices so many have made in their pursuit of our freedom." A limited amount of Homefront IPA will be for sale at the top of the main entrance to the right of the stage. It is brewed with West Coast hops, fresh orange zest, and aged on Louisville Slugger Maple bats. The bats will then be auction off with the proceeds also benefiting Operation Homefront. The Flying Squirrels begin a seven game homestand tonight at 7:05PM with postgame fireworks. Limited tickets are available through the box office and online at www.squirrelsbaseball.com.